With a profile picture of a muscular Emraan Hashmi on your social networking address, countless words about yourself pretending to be someone else and five minute photo ops at the swankiest places with the things in the background we could never afford, nothing is real in our make believe world of internet however there is something which bridges this gap between the real and the virtual world – the spam folder in our mailbox, something which pushes us from the world of dreams we live in to the dark depressing reality. 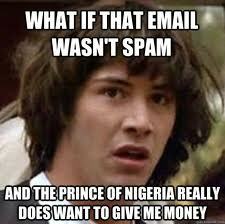 The spam folder is probably the most potent and only tool in the internet which mirrors the economic, social and political milieu of our society. It tells us how a large portion of our population is insecure about the size of their private organs and would want larger private organs. It tells us how Nigerians probably are the most gullible race in the world with the highest percentage of royal lineage and how they are frequently duped of their inheritance by greedy relatives and how the sub standard level of employment created by the government has done no good apart from increasing the levels of frustration in the youth leading to mushrooming of MBA colleges. The top notch colleges never reply to your mails, regarding doubts on filling forms, your long lost friends might have forgotten you but these MBA colleges never do sending you a mail everyday tugging at the strings of your self esteem and making you feel wanted. The mails often accompanied with a picture of a picturesque campus with a lush green campus and monstrous buildings with modern infrastructure are most of the times sent by the director of the institute who most probably would be sending them from his laptop from the second floor of some complex in Sarojini Nagar which by the way is actually their campus. The director’s belief in our faith doesn’t stop there he would also want us to believe last year a student of his got a job with a CTC of INR 63 lakh, what he wouldn’t tell you is the job profile which probably would either be a camel breeder in Middle east or a civil war consultant in Africa. He would carry on the brag fest in the subsequent lines mentioning his faculty, always distinguished people with distinguished degrees who for eternity lived in wilderness but now we are supposed to believe are go getters, global leaders shattering the principles of trade and economics in short quite a big deal. Next comes the foreign university affiliations usually with universities in Balkans or Alaska who to are trying to excite their students about their foreign affiliations with this school in Sarojini nagar. This testing of our faith then reaches the climax as the director finally pulls up an ace rather b school rankings from his sleeve. Never would our ivy league global leader in education school be anywhere in the rankings except in top 10 from ‘ranked second in b schools with best canteen’ to ‘rank fifth among b schools in north east Pune’ to ‘ranked fifth in ambitions’ to ‘Ranked third in the world’ by the global statutory advisory council, a body you could never verify about and which otherwise would have only terrorist training camps and ‘speak English in 15 days’ classes among the other schools in its rooster. The question though arises how do they know about us. Methods are a plenty and it is we fools and greedy who aid them in this pursuit. At times it is our insatiable hunger to give mock tests or an inherent urge to know the 500 sure shot questions in this years CAT which make us register in shady websites with our email ID’s and personal information like our dream college. At times it is their holiness the examination authority realizing how stupid we are looking at our answer papers they themselves forward our Id’s to colleges with a synchronized levels of stupidity and sometimes it is the friendly loan giver usually outside an interview or an exam centre who is more confident of our chances in the exam than we are and is ready to give us a loan sans collateral, sans any guarantor he only wants our phone number and email ID. Finally as entrance exam results start pouring out and 97 percent of the people expecting more than 97 percentile find their dreams quashing , have no idea what do to with their less than 97 percentile marks except venting their anger at everyone from the colleges to the exam authority to the education system and the caste system. It is here the vultures start surrounding the disgruntled candidate ,initially with a sugar coated congratulations on your so and so score becoming the first ones to congratulate the candidate something even he hasn’t done to himself and offering him an instant interview call with complementary lunch. For a while he even contemplates if the congratulations thing is some kind of joke. The candidate disgruntled, shocked at his scores, hopeless with having given the exams for three years with the only calls received from his mom and dad, frustrated either with his job or the previous college degree finally ends up taking admission at what has been now constructed as his dream college. It is only after two years and having come a full circle and his situation worse than what it was earlier he realizes the congratulations call was in fact a joke on him.